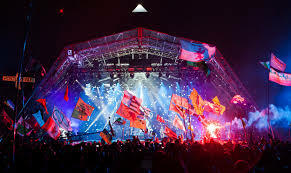 I don’t think we have ever ever ever been this up to date but Mon Pierre has just used his super duper phone to show us the view from Glastonbury…Disclosure alive alive oh! In fact they are also love on telly but we’ve worked out there’s about three seconds delay in the live feed. That’s in case someone in the crowd gets their knob out or whatever so they can pull the plug before we are outraged. Pretty good but having watched Disclosure for the best part of 30 minutes if it weren’t for the lightshow which is quite impressive I’d be snoring. Actually the music is good, nice vibes but stuff like this evolves from the mixing desk in a studio, you can’t do it live from scratch! There’s two main kids possibly just possibly adding a bit of percussion to a laid down track and if anyone doubts me there’s female vocals hard at work but no sign of any singers just the two kids banging on synth drums and the only thing that I can work out that is actually “live” are the cymbals and a few snare drum claps, the rest for the most part is canned. I tell a lie, some girl in wellies and a crop tee shirt and knickers has just waddled and pouted onto the stage, done one track, shaken her bot and then gone off into the blue light! Now to add effect there’s a robot laser face doing the vocals! One of the kids looks like a comprehensive school version of Harry Potter. I missed Dolly Parton! Last track before snooze time and some guy who I’ve never heard of has just come on, he’s called Sam Smith and it sounds like he’s actually doing vocals! Put your hands in the air..sod off. I think you need to be there, maybe Shitfaced and aware that the nearest WC is 20mins away so you just do it down your leg so Pete tells us! Yes,,,,you need to be there! ← Cops save the day, we can sleep peacefully!